Police Scotland is continuing its investigations into a two-vehicle collision which resulted in two people being taken to hosptial with serious injuries. 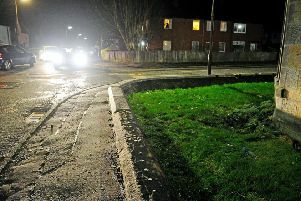 According to a spokesman, as yet no charges have been brought against anyone following the incident which happened in Ronades Road at 8.35pm on Wednesday, January 30. The collision occurred between an Audi A3, travelling south, and a Peugeot Bipper van, travelling north. The 21-year-old male driver and 29-year-old male passenger of the Bipper were taken to Forth Valley Royal Hospital – the driver suffered minor injuries, but the passenger sustained serious injuries. 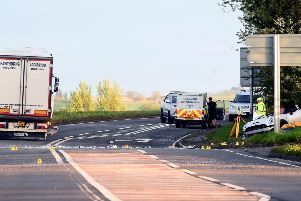 The 24-year-old male driver of the Audi was also taken to Forth Valley Royal Hospital as a precaution, but his 30-year-old male passenger was taken to Edinburgh Royal Infirmary with serious injuries. A Police Scotland spokesman said: “Police in Forth Valley continue to investigate a two-vehicle collision in Ronades Road, Falkirk which occurred around 8.30pm on Wednesday January 30. “The driver of the van sustained minor injuries, while the passenger was more seriously injured, but has since been released from hospital. The 30-year-old male passenger of the Audi was taken to the Royal Infirmary of Edinburgh where he is still receiving treatment for serious injuries.